This Greeting Card is available in design variants of birthdays and other occasions. All an invites can be customize in your choice of color, material and design. You may choose multiple reference design from our collection and create your design. - Extra inserts inclusive of printings : 25 Rs. - Extra inserts Minimum Order Quantity : 100 min. A greeting card in the shape of a paper purse. The card opens to reveal a beautiful embellished cake. Can be used for birthdays, anniversaries. The card is also available without the cake. In this case it can be used as a gift box for small items. 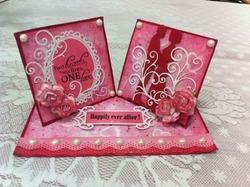 We design customiezed Anniversary Cards. Our Anniversary Cards are exclusive and are in vibrant colours. They are stylish and elegant. 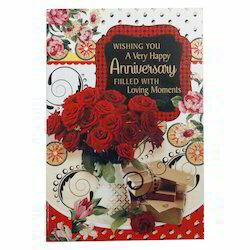 We are engaged in offering high quality Anniversary Card to our customer. we are offering printed Anniversary Invitation cards. An attractive anniversary card for your loved one!